The Weidel Corporation began with plenty of hope and enthusiasm but with little capital. In fact, according to the first ledger, Karl Weidel Jr., who started the Weidel Corporation in 1915, had all of $25 when he opened an office in the old American Mechanics Building on East State Street in Trenton. Only 23 years of age at the time, Karl Weidel Jr. was well known as a licensed insurance and real estate broker. When Karl Weidel Jr. was called into military service during World War I, his wife managed the real estate and insurance office and did so well that she became a permanent member of the company in addition to raising their children, Karl III, Richard Sr., and Elizabeth. Karl III and Richard Sr., who served in World War II, took over the business in 1949. Karl III focused on the Insurance Department while Richard devoted himself to Real Estate. Operating in Mercer County and nearby areas in Pennsylvania, they concentrated on customer and client needs. Richard Sr.’s professionalism, high standard of ethics and passion as a realtor, helped the entire industry to better serve homebuyers and sellers. He was esteemed by his peers for his many contributions. He was named Vice President of the New Jersey Association of Real Estate Boards and was a founding member and President of the Trenton and Mercer County Multiple Listing System. He was the first broker in Mercer County to be honored by the National Association of Realtors as ‘Realtor Emeritus’ for his 50 years of service. Richard Weidel, Jr., Weidel's current CEO, joined the company in 1979 just when the credit markets were entering a very chaotic period. He guided the company and the housing industry through one of its toughest phases. 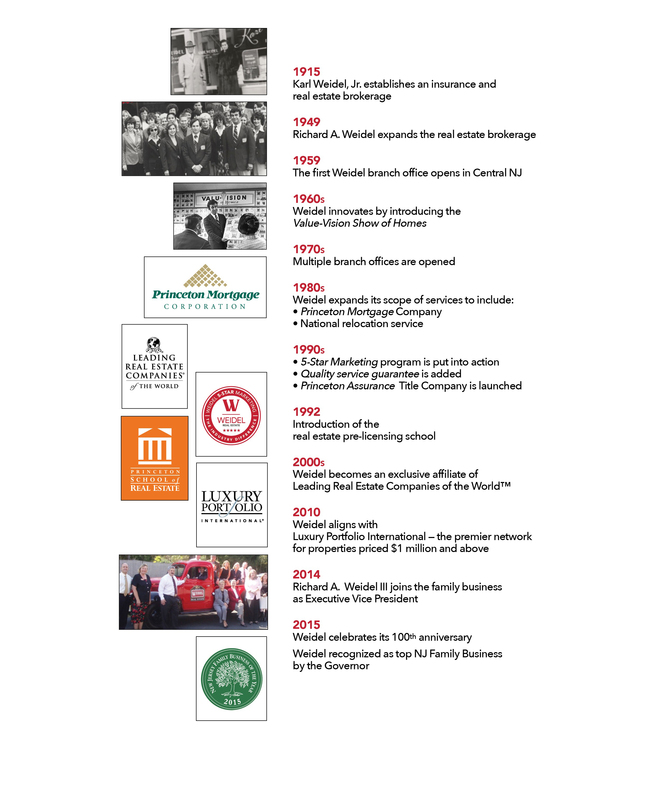 Under his leadership, Weidel Real Estate expanded rapidly by adding Princeton Mortgage Corporation, relocation services and The Princeton School of Real Estate. Princeton Assurance Corporation came under the Weidel umbrella in the 1990s. Throughout the company’s trying times and remarkable success, Mr. Weidel has remained accessible to everyone in the company. Furthermore, he has maintained his family’s 100-year tradition of commitment to quality service, personally guaranteeing customer satisfaction. In 2014 Richard Weidel III joined the Weidel Corporation as Vice President of the organization. The succession of leadership to a fourth generation, extremely rare in American business, coupled with the Weidel Corporation’s on-going growth from a solid foundation, is particularly noteworthy within the business sector. Richard Weidel III refers to his father as “The most successful businessman I know.” Weidel III acquired from his father a deep appreciation for the people who make up the organization and are the source of its success over the last century. With the addition of the fourth generation and a dedicated and talented team, the Weidel Story is a special one indeed. "We are confident that the Weidel Corporation has an another exciting 100 years ahead, and a rare opportunity to lead and to serve into the future,” says Richard Weidel, Jr.